This pretty burlap guest book adds rustic charm to your wedding or special occasion decor. Each natural burlap guest book is embellished with lace and a natural jute flower adding the perfect rustic feel to your wedding. The wedding guest book comes with a burlap and lace pen holder along with a beautiful silver pen. with 10 lines on each page for guests' names and thoughtful wishes. The book includes introductory pages with sections to fill out the details of the wedding, the bride's attendants and the groom's attendants. The pen holder measures 3.94" x 3.94" inches (10" x 10" cm) and comes with a silver pen. ✔ Made from natural burlap, lace and jute. 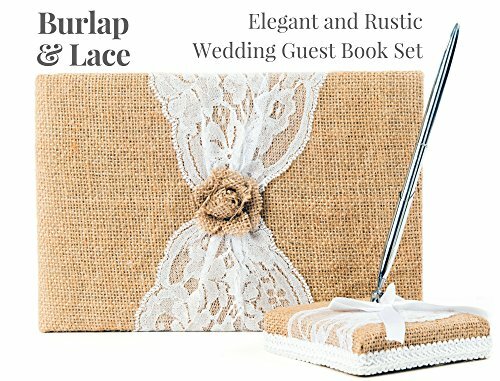  HIGH QUALITY WEDDING GUEST BOOK SET This beautiful guest book made of natural burlap and lace, along with a pen holder and silver pen, makes for a great wedding, bridal shower or baby shower gift. Guest Books are perfect for cherishing the warm wishes and memories of your friends and relatives at your occasion.It also comes in an attractive gift box.  CHERISH YOUR WEDDING MEMORIES Each guest book comes with 120 pages of lined papers and measures 9.65" x 6.5" inches (24.5" x 16.5" cm) so your guests have enough space to write their thoughtful wishes on your special day. The book includes introductory pages with sections to fill out the details of the wedding, the bride's family, the groom's family, the bride's attendants and the groom's attendants.  100% HASSLE-FREE GUARANTEE: Better Line ® strives to provide quality products and service. While our wedding guest books are made of high-quality material, should you have any issue with your purchase, feel free to contact us for a full refund or exchange. Your happiness with your purchase is our #1 priority! If you have any questions about this product by Better Line, contact us by completing and submitting the form below. If you are looking for a specif part number, please include it with your message.